If you’re celebrating the season with a fancy end of the year orchestra performance, then ‘Hark!’ We’ve got pre-event advertising that will leave even the most skeptical promoters mute. 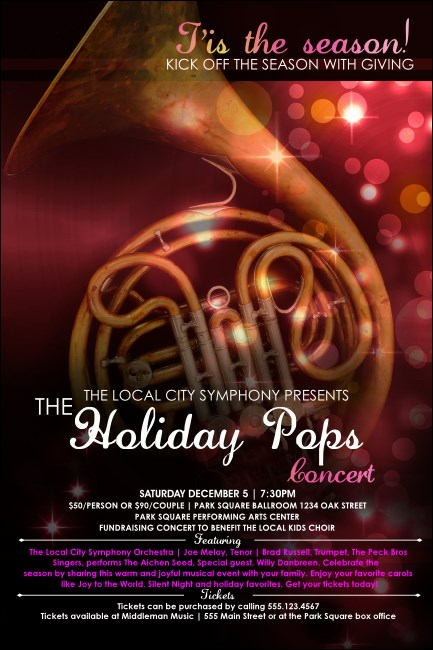 The Symphony Holiday Pops Poster template feature a detailed French horn accented by shimmering pink and orange lights. A most elegant way to advertise the popular Christmas music to come. TicketPrinting.com can help you stay sharp and keep your event from falling flat.